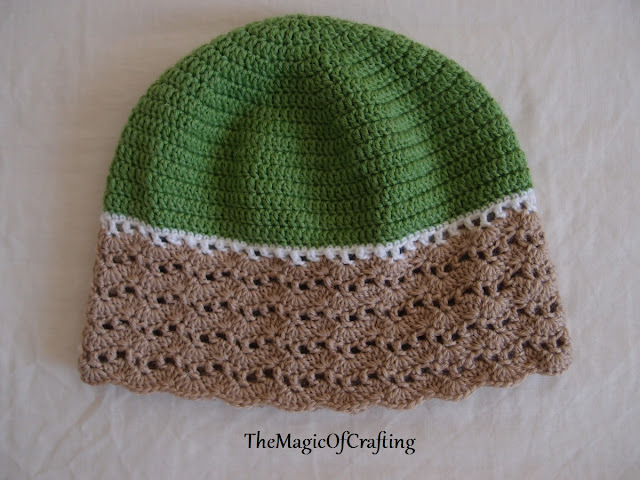 September is the time to get ready for the winter season and start making Christmas gifts. 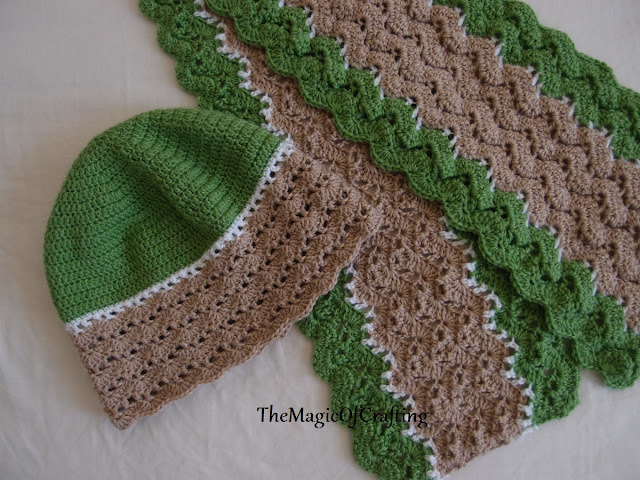 The following hat is especially created by request to match the Easy Wave Scarf that become quite popular. 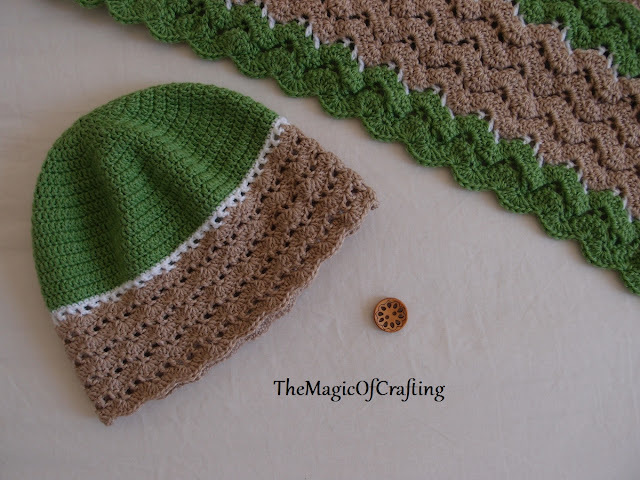 The pattern stitch is adapted for the hat but if you already have experience with the scarf it won't take too long to have a wonderful winter set. 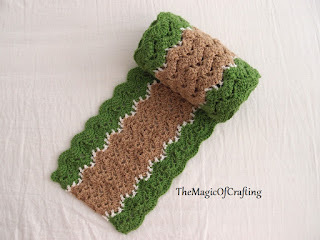 I am very happy to announce that recently I got a designer profile at www.allfreecrochet.com, which has always been a great resource of free crochet projects and tutorials. They also have regular newletter with latest/hottest patterns so if you are always searching for your next crochet inspiration don't forget to sign up for their newsletters too. Cluster of 5 dc - * Yo, insert the hook into the next st or ch space, yo, draw a loop, yo, draw through 2 loops on the hook *, repeat 4 more times, there will be 6 loops on the the hook, yo and pull through all loops. Cluster of 5 dc made. Cluster of 5 dc in beginning of the row - ch 2 (counts as dc), * Yo, insert the hook into the starting st, yo, draw a loop, yo, draw through 2 loops on the hook *, repeat 3 more times, there will be 66 loops on the the hook, yo and pull through all loops. Cluster of 5 dc made. 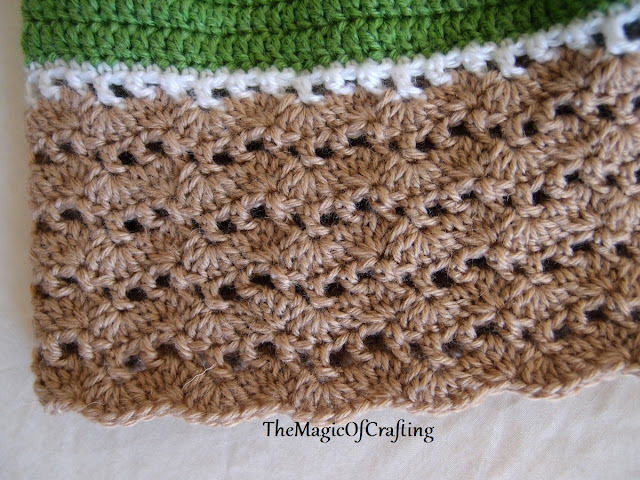 Shell stitch - 5 dc in the same st. If it is in the beginning of the row then it is ch 2 and 4 dc in the starting st. In mc ch3, work 11 dc. Round 1: Ch 2, dc in same st, 2 dc in each st, end with ss (24st). Round 2: Ch 2, dc in same st, 1dc in next st, *2 dc in next st, 1 dc in next st *, repeat * - * till the end of the round, end with ss (36st). Round 3: Ch 2, dc in same st, 1dc in next 2 st, *2 dc in next st, 1 dc in next 2 st *, repeat * - * till the end of the round, end with ss (48st). Round 4: Ch 2, dc in same st, 1dc in next 3 st, *2 dc in next st, 1 dc in next 3 st *, repeat * - * till the end of the round, end with ss (60st). Round 5: Ch 2, dc in same st, 1dc in next 4 st, *2 dc in next st, 1 dc in next 4 st *, repeat * - * till the end of the round, end with ss (72st). Round 6: Ch 2, dc in same st, 1dc in next 5 st, *2 dc in next st, 1 dc in next 5 st *, repeat * - * till the end of the round, end with ss (84st). Round 7: Ch 2, dc in same st, 1dc in next 6 st, *2 dc in next st, 1 dc in next 6 st *, repeat * - * till the end of the round, end with ss (96st). Round 8: Ch 2, dc in same st, 1dc in next 7 st, *2 dc in next st, 1 dc in next 7 st *, repeat * - * till the end of the round, end with ss (108st). Round 9: Ch 2, dc in same st, 1dc in next 8 st, *2 dc in next st, 1 dc in next 8 st *, repeat * - * till the end of the round, end with ss (120st). The crown part is made. Now you should have flat circle that measures 7in/18.5cm in diameter. Round 10-15: Ch 2, dc in same st, dc in each stitch around, end with ss in ch2. To get the correct number of stitches for the weaves part (if you have made manual adjustments) make sure your stitches are multiple of 6. Round 16: Ch 3, skip one st, * dc in the next st, ch 1, skip one st *, repeat * - * till the end of the round, end with ss in the middle of the starting ch(in ch 2). Start with * shell stitch of 5 dc (see in the notes), followed by cluster of 5 dc *, repeat *-* around, end with cluster of 5dc then join in the starting shell with ss. Round 18: With brown repeat round 16, make sure you have dc in the both end and top st of the cluster. End with ss. Round 19: ss in the next ch sp, ss in next ch. Now ch2, followed by 4 dc in the same st (starting shell st). It should be right above the shell st of the previous shell-cluster round. Continue with cluster of 5 dc, *shell st of 5 dc, cluster of 5 dc*, repeat *-* around. End with cluster of 5 st, join it with ss to the starting shell. Round 21, 23, 25: Repeat round 19. Round 22, 24: Repeat round 18.